A harbor seal pup is released back into the wild at Charlestown’s Blue Shutters beach. Photography by James Jones. They lounge on the rocks around Narragansett Bay like well-fed tourists catching some sun. But even though seals have been visiting for decades, scientists say there are still mysteries about these intriguing winter guests. The parking lot at Blue Shutters beach in Charlestown is overflowing with vehicles, even though the temperature on this mid-October morning is just 50 degrees and strong winds and threatening skies make the beach unappealing to sunbathers. 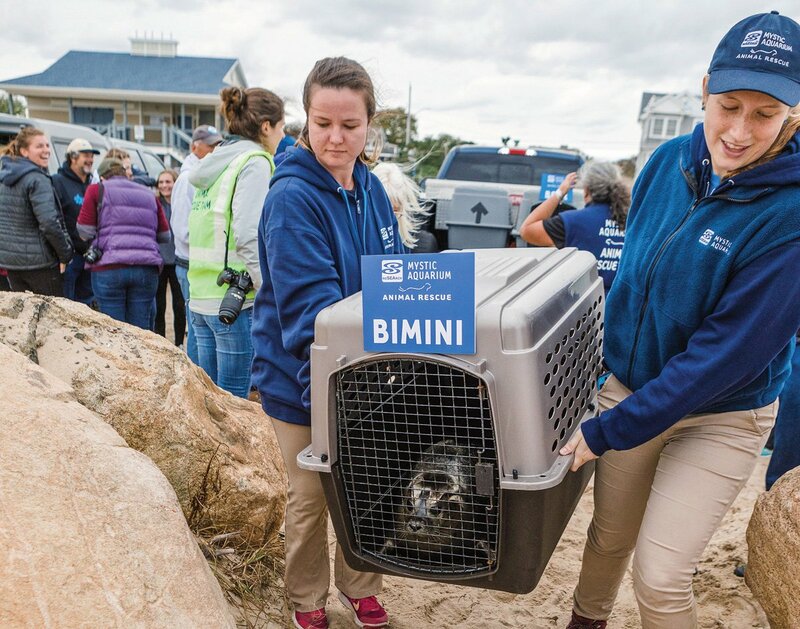 The attraction for the 200 people bundled in winter coats and rain gear is the six harbor seal pups that are being released back into the wild by Mystic Aquarium in Connecticut; the animals had been abandoned by their mothers the previous spring. Standing behind a rope policed by aquarium volunteers, the onlookers watch as six large crates are unloaded from a blue Ford pickup truck, lined up side-by-side about twenty yards from the water line, and simultaneously opened to release the seals. One pup, named Kauai by its aquarium caretakers, immediately races straight toward the water in a clumsy, caterpillar-like manner, then hesitates as he approaches the crashing waves. That allows Tigres to slide into the water first and quickly disappear. Kauai then changes his mind and heads back toward his crate before apparently rethinking his strategy and turning toward the water again. A third seal, equipped with a satellite tracking device, soon joins Tigres in the roiling Atlantic. The three remaining seals seem uncertain whether to enter the water or remain on the beach. Or maybe they just enjoy playing in the crashing surf. They wander several hundred yards back and forth along the ocean’s edge for nearly an hour, occasionally galumphing into the water only to be tossed back ashore by the waves. One almost makes it past the surf line before catching a wave like a boogie boarder and riding it all the way back to the beach. By the time all of the animals reclaim the marine environment as their true home, most of the crowd has disappeared and the aquarium officials have packed up the crates for their trip back to Mystic. 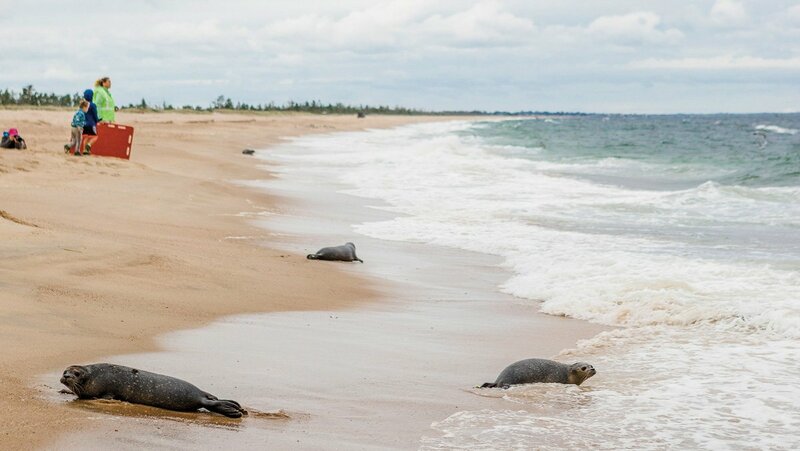 Mystic Aquarium responds to about sixty reports of stranded marine mammals and sea turtles on beaches in Rhode Island, Connecticut and Fisher’s Island, New York, each year, most of which are seals found on Rhode Island’s ocean-facing beaches. Five to ten of those calls result in the animal being brought to the aquarium’s clinic for long-term care. The aquarium also accepts seals from elsewhere in the Northeast when other rehabilitation facilities are full. 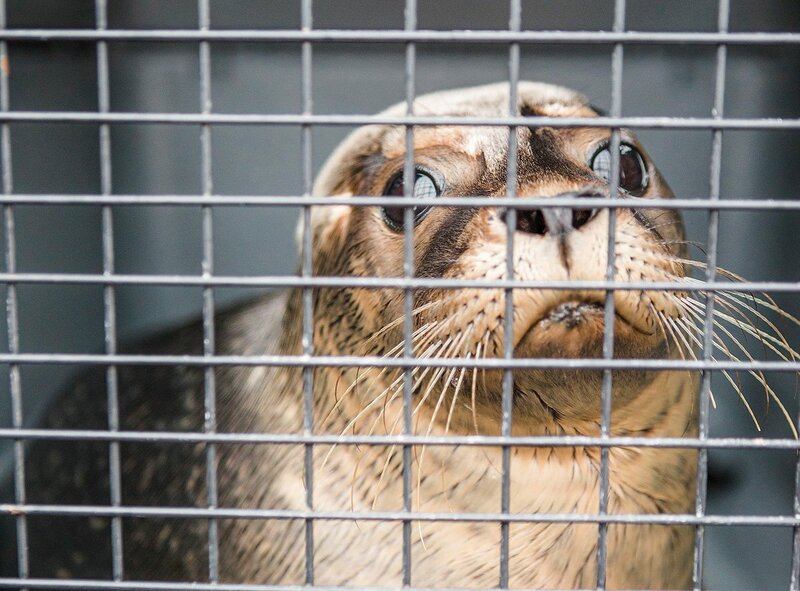 Most are abandoned harbor seal pups that are rescued in May, when they should still be nursing. Kellie Stagge (left), a fellow at Mystic Aquarium and intern Jennifer Riling. Photography by James Jones. By September or October, the animals are ready to be returned to the sea. Harbor seals have made a dramatic comeback in Rhode Island waters in the nearly half-century since the Marine Mammal Protection Act was passed in 1972. Until then, seals were hunted everywhere they could be found, including in Narragansett Bay, where some boaters were reported to shoot seals for sport. In Massachusetts and Maine there was even a bounty of $5 paid for every seal killed because fishermen claimed the animals were eating their catch. 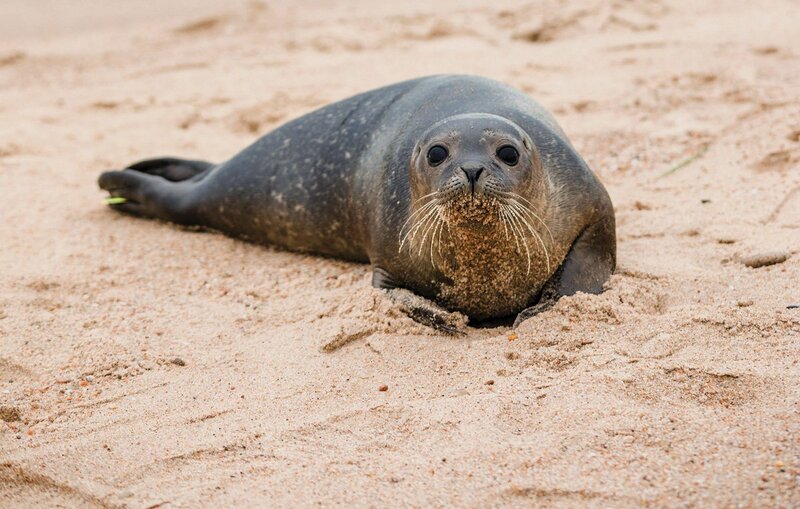 When the legislation prohibited the harassment or killing of seals, seal numbers began to grow and their range expanded. Today, approximately 100,000 harbor seals can be found in New England waters, some of which spend the winter months in Narragansett Bay and Rhode Island Sound. Growing up to six feet long and 350 pounds — one quarter of which is an insulating layer of blubber — harbor seals are widely distributed throughout coastal regions of the North Atlantic and North Pacific, where they swim in the surf, haul themselves onto rocks to rest at low tide, and feed on a variety of fish, squid, crabs and other marine creatures. Those that visit Rhode Island between October and April return north to Maine and the Canadian Maritimes for the breeding season. Despite the warming waters from the changing climate that is shifting many marine populations northward, the seals are instead expanding their range southward, with winter haul-out sites now occupied as far south as Virginia, though they don’t breed south of Cape Cod. It’s unclear how many harbor seals spend the winter in Narragansett Bay, but an annual count of seals at twenty-five sites where the animals haul out of the water at low tide documented 566 seals in 2017 and 423 in 2018. The record was 603 in 2016. The count is held in late March, when the seal population in the bay is typically at its peak before the animals begin to move northward. About twenty volunteers participate in the count each year, including staff from Save The Bay, the U.S. Environmental Protection Agency and the Narragansett Bay National Estuarine Research Reserve. Rome Point in North Kingstown, Brenton Point in Newport, Rocky Point in Warwick, and Church Cove and Usher Cove in Bristol are what Lewis calls “sentinel sites” that tend to have the highest number of seals during each low tide and are usually occupied early and late in the season. Lewis acknowledges that the annual seal count isn’t an accurate estimate of the total number of seals that winter in the bay, since many animals are likely in the water or at other haul-out sites during the survey. But the count provides a minimum population number that can be used for comparison. The only attempt to scientifically determine the total number of seals that spend the winter months in the bay was a statistical analysis conducted by Kenney’s former graduate student, Cheryl Schroeder, in 2000. Using data from a variety of informal counts of seals hauled out on rocks at low tide as long ago as the 1960s and her own counts in the late 1990s, she factored in animals that may have been underwater or missed during the counts and calculated that the bay-wide population was between 800 and 1,000 animals. Since then, the number of seals counted by Save The Bay volunteers has nearly doubled, so a student at Roger Williams University is redoing Schroeder’s analysis this year to determine the current population.